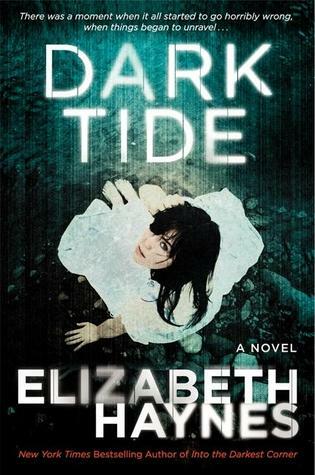 Thanks to TLC Book Tours, we're pleased to present a review for Dark Tide, the newest mystery from Elizabeth Haynes. Make sure to check out the rest of the tour stops for more reviews! The author of the acclaimed debut thriller Into the Darkest Corner returns with a taut, gripping murder mystery featuring a compelling heroine who unwittingly finds herself caught in an underworld of murder, corruption, and betrayal. Dark Tide is a mystery following Genevieve, a former Londoner who quit her high-powered sales job to follow her dream and move out onto a houseboat to get away from it all. She also leads a bit of a double life -- in order to more quickly achieve that dream, she takes up a second job dancing at a gentlemen's club. The book bounces back and forth between the present, where Genevieve is dealing with the fallout from discovering the body of a friend from the club, and the past, as we follow Genevieve as she manages her two jobs and all of the chaos that happens when the two accidentally wind up mixing. The jumping back and forth in time can be somewhat confusing. At least in the ARC I reviewed, there weren't always clear indications of when these time shifts were happening, so sometimes I'd move into a new section thinking "but so-and-so wasn't at Genevieve's boat" or otherwise being confused. Those sort of shifts in narration are almost always tricky, so it would have been nice even if there was just a nice little line divider or something other than some extra spacing. Genevieve is an interesting character who can be difficult to like at times. On one hand, she is determined to get her way and live her dream -- she is going to live on this houseboat and she is not going to let anything stop her. She is educated and is pretty no-nonsense. On the other hand, she can be frustratingly naive -- she seems to have no idea what she's gotten herself into at the club she dances at, and I feel like a lot of her problems in the "present day" part of the story could have been avoided if she'd been more truthful and less stubborn. The way she's written, she just comes across as very disconnected, so sometimes it's hard to sympathize with her, even when bad things are happening. I did like the look at Genevieve's dual life -- her all-business persona when she was dancing at the club, compared with her more laid back lifestyle with her fellow house-boat friends at the marina. And it was neat to try to put the pieces together to figure out what was going on, who was after Genevieve, etc. There were a few aspects which were obvious, and some which I didn't see coming. One character, I was suspicious of from the first time he appeared -- fortunately, I wasn't completely right with my guesses on that one, but he still wasn't acting entirely out of the goodness of his own heart. I was a little bit unsatisfied with the ending -- I didn't buy the romance aspect to the story, and the ending really hinges on that, so other readers may not be annoyed by it. This book does have a fair amount of violence (to people mostly, and one animal), drinking/drug use, and sexual situations (though nothing described too graphically). Elizabeth Haynes' previous novels, Human Remains and Into the Darkest Corner, have gotten pretty excellent reviews, and I'm hoping to check those ones out in the future too. Thanks for this great review! I like mysteries and between Genevieve's double life and trying to figure out who murdered her friend, this sounds like it has a lot of action! I will have to check this out! I've heard great things about INTO THE DARKEST CORNER as well - hope you enjoy that one too!